This is a beautiful palette of 15 gorgeous shades in neutral shades. 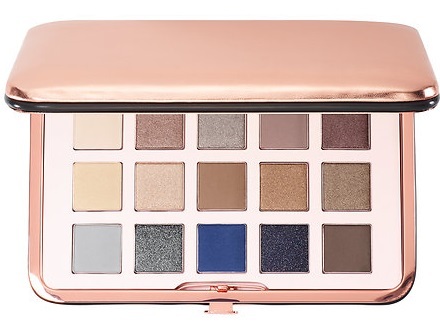 The palette contains 15 matte and shimmering eye shadows, from chic beige to luminous copper, metallic gray and intense sparkly black, there's a range of colors to achieve any look. With a unique clutch case and a large mirror on one side included, this palette is ideal for holiday party touch-ups or gift giving. 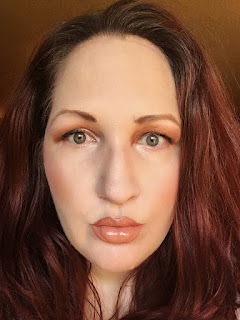 On my eyes are a dark beige in the crease followed by a dark brown in the transition and a sparkly copper on the lids. The rest of my products coordinate with the eye. You can see how pigmented almost all of them are. A couple of them are lighter in pigment but are heavy on sparkle. I would use those over the more pigmented eye shadows. Or use as a light wash on the lids or under the brow. The SEPHORA COLLECTION Once Upon A Look Eyeshadow Palette is a great gift because of the price point. You can give if to just about anyone: Secret Santa, wife, girlfriend, sister, mother, daughter, friend, best friend, etc. This product retails for $38.00 and can be found online at www.sephora.com or in SEPHORA stores. Like SEPHORA on Facebook: https://www.facebook.com/Sephora?ref=br_tf; Follow SEPHORA on Twitter: @Sephora, Follow SEPHORA on Pinterest: http://www.pinterest.com/Sephora/; Follow SEPHORA on Instagram: http://instagram.com/SEPHORA; Subscribe to SEPHORA on YouTube:http://www.youtube.com/channel/UC9YX5x_VU8gfe0Oui0TaLJg; Follow on Google+: https://plus.google.com/+ Sephora/posts; Follow SEPHORA on Wanelo: http://wanelo.com/sephora and Follow SEPHORA on Tumblr:http://theglossy.sephora.com/.